3 x 100g of Shelf life Squabs. 1 x Medium Swivel Stonze of 2.0 oz – 2.5 oz. 1 x Gripz Hair Rigs. This high quality and well-designed Carp Short Session pack gives the angler a concise selection of Pallatrax products to create the highly regarded and consistently successful fishing approach – The Stonze System. 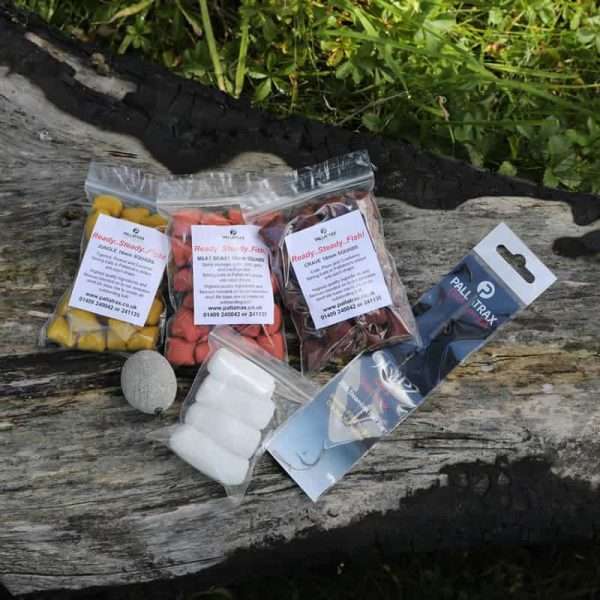 This revolutionary angling tactic has moved fishing to the next level by completely eliminating the negatives of a man made toxic lead (or any other man made weights) and centralising the strategic approach around a totally natural stone as the fishing weight. Couple this with exclusive baits and our incredible Gripz hook design the user can be confident in any angling approach that catches consistently at venues around the world. The effectiveness of the Stonze System means that the many barriers to advanced catching are now removed opening up consistent catching for all, whatever experience you have. By eliminating the complicated paraphernalia that currently saturates the market, and replacing with such an effective and simple to use approach anglers can now be extremely confident in fishing successfully, safely and catching more, wherever they go. Don’t forget we offer a free gift wrapping service with this product as they make a great angling present! 3 x 100g of Shelf life Squabs. Flavours: Jungle, Crave and Meat Beast. Sizes 14mm or 18mm. Definitely give it five star rating, Everything was as stated in the offer, FAULTLESS !